The entire ride is themed towards the experience of racing a Top Fuel Dragster. Riders board a train that resembles a real Dragster, and the train moves into a starting line position. A board of multi-colored lights, similar to a "Christmas Tree" board seen in drag racing, signal to the riders when the ride is beginning, with a series of yellow lights flashing, and then a row of green lights, signaling go for the launch. As soon as the green lights flash, the train is launched rapidly forward, and then up a 420 feet climb at 90 degrees, all while reaching a speed of approximately 120 MPH in four seconds. Near top of the climb, the track rotates 90 degrees, and the train ascends the top hat. After clearing the top hat, the track then does a 270-degree twist, and the train free-falls over 400 feet, at mostly a 90-degree angle, ultimately returning to the station and exit platform. The ride, from launch to end, lasts approximately 17 seconds. 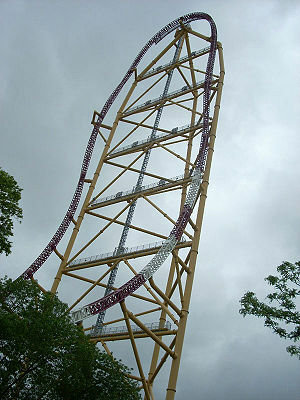 Occasionally, a Top Thrill Dragster train will have a "rollback", meaning a launched train fails to make it up the climb and over the top hat. When a rollback occurs, magnetic brakes on the track slow the backwards moving train, and eventually stop it altogether well before it reaches the station, averting what otherwise would be a possible disaster. This page was last modified 23:00, 26 March 2010.